Matthew Ball (Romeo) & Lauren Cuthbertson (Juliet) (c) Helen Maybanks. Romeo and Juliet is one of the most famous ballets in the repertory and needs little introduction whether in Rudolf Nureyev’s fate and death-haunted version for English National Ballet (review click here) or Kenneth MacMillan’s celebrated – and more romantic – production for The Royal Ballet which premiered in February 1965 with Nureyev and Margot Fonteyn in the title roles. Many will know how this tragedy unfolds but for those who need to ‘Brush Up Your Shakespeare’ the ballet opens in Verona during the Renaissance where the two leading noble families, the Capulets and Montagues, are sworn enemies. A young Montague, Romeo, declares his love for the haughty Rosaline. Together with his friends, Mercutio and Benvolio, they quarrel with Lord Capulet’s nephew, Tybalt, and blood is soon split. Escalus, the Prince of Verona, orders the families to end to their enmity, and reluctantly everyone downs swords. Continuing to pursue Rosaline Romeo infiltrates the Capulets’ ball. Meanwhile, Juliet, a pubescent Capulet and Tybalt’s cousin, has been introduced to her prospective fiancé, Paris, but at the ball she meets Romeo and there is an instant attraction. With the help of the sympathetic Friar Laurence and Juliet’s conspiratorial nurse, the lovers marry in secret. Events then take a tragic turn after Mercutio is killed fighting Tybalt and is avenged by Romeo who, as a result, is then forced into exile. The deaths, of course, have not yet ended, though MacMillan was particularly keen that there should be no reconciliation between the feuding and grieving families as in the original Shakespeare. It may seem unnecessary to repeat a well-known tale, but it highlights the outstanding storytelling we see in Kenneth Macmillan’s Romeo and Juliet, even in this umpteenth revival 54 years after it was first put on at Covent Garden. Some of the acting was worthy of straight theatre and it is not a surprise that MacMillan (and his designer Nicholas Georgiadis) were inspired by Franco Zeffirelli’s production of the play at the Old Vic in 1960-1961. As Jane Parry’s introductory programme essay (Creating a Classic) explains ‘MacMillan wanted a similar verismo atmosphere for his ballet’ to distinguish it from other leading versions of the time by Leonid Lavrovsky at the Bolshoi or John Cranko for Stuttgart Ballet. My only issue is that MacMillan needs his audience to realise that Romeo never received Friar Lawrence’s message about the sleeping potion he gave Juliet. Nureyev shows us this and so completes the story. Nicholas Georgiadis’s sumptuous designs are solidly three-dimensional and evocative – thanks to John B. Read’s subtly atmospheric lighting – of Italian Renaissance frescoes that have come to life, even if the colours are a little more muted. 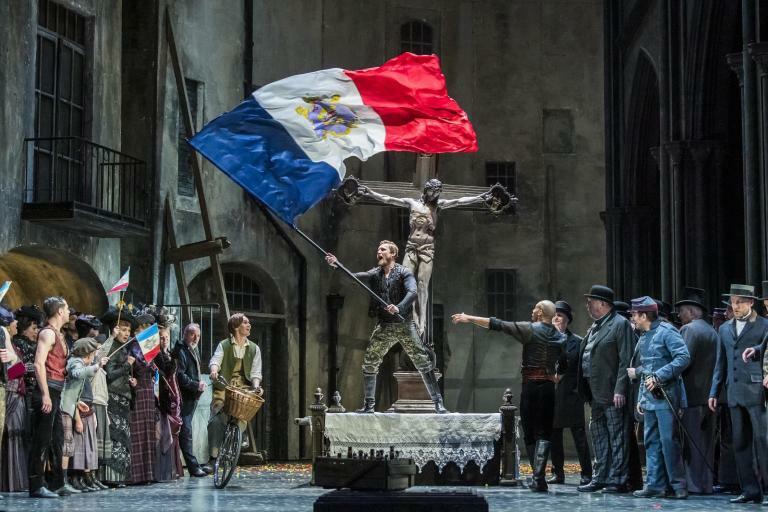 After a splendid Don Quixote (review click here) it was a pleasure to see the Royal Ballet dance so consummately well once again and, even more importantly, act with such great commitment and spirit. The corps de ballet roistered appropriately with considerable enthusiasm for some of MacMillan’s more bawdy skirt-lifting moments and the sword-fighting was some of the best I have ever seen on any stage anywhere. What is clear is that although there will be much to enjoy when this production can be seen in cinemas on 11 June, so much goes on across the stage that this Romeo and Juliet is best appreciated in the theatre. My own history with it at Covent Garden goes back to 1977 (where has that time gone?) but I will not look back too much and instead celebrate the ‘School of 2019’. Christina Arestis was a haughty Rosaline, with Itziar Mendizabal, Claire Calvert and Mayara Magri as the engagingly flirty harlots. Ryoichi Hirano brought considerable presence to the stoic Paris, a role that often makes little impact. Marcelino Sambé (who will later dance Romeo) displayed his considerable virtuosity leading the Mandolin Dance. As ever this staging allows for two outstanding vignettes: first from Elizabeth McGorian as the imperious Lady Capulet whose mourning over the dead Tybalt was appropriately heart-rending and the other from Kristen McNally as a playful, compassionate – and a little more youthful than usual – Nurse. This ballet naturally relies on the leads for its success and Lauren Cuthbertson was outstanding as Juliet and one of the very best of the many I have seen. She is totally convincing as the teenage Capulet. Cuthbertson is a wonderfully lyrical dancer with a light easy jump, splendidly fast turns and quick feet (those exquisite bourrées!). Cuthbertson showed Juliet’s coming-of-age with astonishing artistry and some of her even better moments were when she was not even dancing; for instance when Juliet first spots Romeo the audience can almost feel her visceral reaction; and during the balcony scene when she places Romeo’s hand on her heart it clearly indicated how Juliet is uninhibitedly yielding to her innermost desires. This is to be compared to her resistance to her father’s bullying in Act III and her obvious revulsion at being forced to marry Paris is shown as she can barely look at him. Am I right to think that previously Lord Capulet sometimes brutally slapped his daughter? Thankfully this moment has been changed to Juliet covering her ears to shut out her father’s hectoring. It was here that Cuthbertson’s performance took on emotional gravitas having transitioned effortlessly from girly glee to a more worldly-wise desperation. As Jane Parry explains in her essay it is well-known how MacMillan created the role of Romeo on Christopher Gable (with Lynn Seymour as Juliet) yet some of the intricate steps we see during his variations have been forever associated with Nureyev. I saw him dance the role several times in both this, as well as, his own production and it is nearly impossible for anyone who follows in his ‘footsteps’ to make the role his own, especially for those who saw him in his prime. This is very similar to the fault in Oleg Ivenko’s portrayal of the great Russian dancer in Ralph Fiennes’s intriguing film, The White Crow; his recreation of his difficult character is exemplary, but his dancing lacks élan and animal magnetism especially compared to the few minutes of the real Nureyev seen during the closing credits. Matthew Ball is in his mid-twenties and looks an ideal Romeo. Initially he seems just one of the lads, nevertheless there is an instant likeability about him. Is he perhaps just a little too easy-going in his cultured dancing? Where there should be hot-bloodedness there is only boyish brio, such as in the Act I balcony pas de deux. Although when he kisses Juliet there is a palpable frisson and Ball finds some genuine fire in his belly for the Act II swordfight, as well as, showing great tenderness and grief at the close. If this is how he has been taught Romeo then he does what was asked of him extremely well. Also there is no underestimating the security and strength of his partnering that helped make Lauren Cuthbertson’s Juliet look even better than it undoubtedly was already. Romeo and Juliet is perhaps MacMillan’s masterpiece and it proves a splendid showcase for the encouraging current health of The Royal Ballet. Referring to the Lavrovsky Romeo and Juliet Parry writes how it was a showcase for ‘an ensemble of dance-actors who brought the tragic story to teeming life’. This exactly expresses my feelings about how The Royal Ballet danced MacMillan’s Romeo and Juliet on this occasion. This great Company achievement was underpinned by solid playing from the Orchestra of the Royal Opera House under their music director Koen Kessels. Any musical rough edges will be smoothed out over successive performances (that have multiple changes of cast) though they still brought out sufficiently – with equal measures of finesse and robust power – all that is mercurial and dark about Prokofiev’s score. For more about The Royal Ballet at Covent Garden or in the cinema click here.